The RPGTV Steel City Cup gets underway at Sheffield this evening and with £10,000 going to the eventual winner it is a prize that all the participating connections would love to get their hands on. As you’d expect for a competition carrying such prestige and prize money , the entry list was full of quality. Any greyhound hoping to emulate the achievement of the 2018 winner Roxholme Nidge , will need to show guts , stamina and pace in abundance over the 500m course at Sheffield’s Owlerton Stadium. Indeed , last years winner , unraced but well trialled since , will be looking to retain his title by showing all the attributes that led to an odds on success in last years October final when beating Nadurra Ross by 1 1/2 lengths in 28.53 at odds of 1/2. I caught up with Mark Keightley , husband and assistant to trainer Hayley who said: “We are a little behind where we would like to be with Nidge going into the Steel City , but he goes there healthy if not 100% fit. “The run will definitely bring him on. I must say this event is very strong in depth , certainly more so than the competition he won last year , which though toughens things for us and Nidge, is great for what is a thriving track in Sheffield and the sport in general. Regards Nidges heat , there is good pace inside him , particularly Plaza Lep who has been showing terrific early at Nottingham lately and usually traps well , therefore we’ve got to try and get to the front as quickly as we possibly can to limit any potential complications in qualifying. “No matter what happens at Sheffield , Nottingham is very much at the back of our minds , we were very disappointed to miss out on the Derby at Towcester last year through serious injury , we don’t want to feel that disappointment again so we’ve tried to protect Nidge as much as possible until this point”. Nidge jointly heads the antepost market at between 7/2 and 9/2 alongside the classy Angela Harrison trained Droopys Verve. He made his racing comeback for 2019 when running an awesome race from behind to pick up long time leader Headford Johnny on the run in when winning a 500m open here at Sheffield last week in 28.82 (-20). It was some effort and should be served as a serious warning to all that this is a dog that is going to take a lot of beating whenever and wherever he lines up this year. Verve had to play second fiddle , though by no means disgraced , when finishing runner up in last years Derby final to Dorotas Wildcat. Verve went on to claim much deserved success in 2018 when landing the Dundalk International and latterly the William Hill All England Cup at Newcastle. 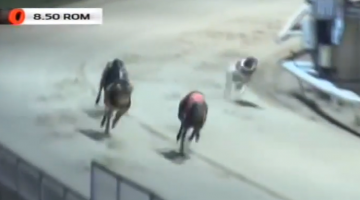 Though he was to again finish runner up to Wildcat in the MSCM Ltd Eclipse Final at Nottingham , he lost absolutely nothing in defeat and this dog has the potential to mark himself out as an all time great this year. Seaglass Phantom is next in the betting for his shrewd handler Patrick Janssens and comes into the competition in fine form having run out an easy winner of a high class Racing Post Juvenile at this venue last week. That kind of form will see him prove a danger to any greyhound and he is priced up at between 9/2 and 6/1 in the antepost book. The RPGTV Steel City Cup looks set to be a terrific competition , if you can’t make it down to Owlerton , where you are sure to be looked after by the excellent team there , then be sure to catch all the action live on channel 431.